Back row(Left to right):- Kirsty ?, Chanine Mackenzie, Lucy clapson, Shona Whittenham, Lyn Williamson, Lorraine Kent. Third row:- Rachel Clarke, Fiona Coutts, Peter Smith, Elaine Duncan, Martin Munro, Gordon Maxwell, Jamie Mackay, Alan Hearn, David Russell, Dawn Fraser. Second row:- Stuart Armstrong, Adam Cran, Sam Croucher, Brian O'Hare, Lorna Ferguson, Kevin Cran, Shaun Fraser, Melanie Mitchell, Danny Mullins. Front row:- Victoria Maclellan, Lea Savage, Thereza Majewski, Bryan Campbell, Fiona Campbell, Ruaridh Maclennan, Annalee Henderson, Jane Mason. Second name of Kirsty is Jones. Cheers Savage! What happened to the class of 1992/93? Anyone left in invergordon? I know that Lucy Clapson has moved. 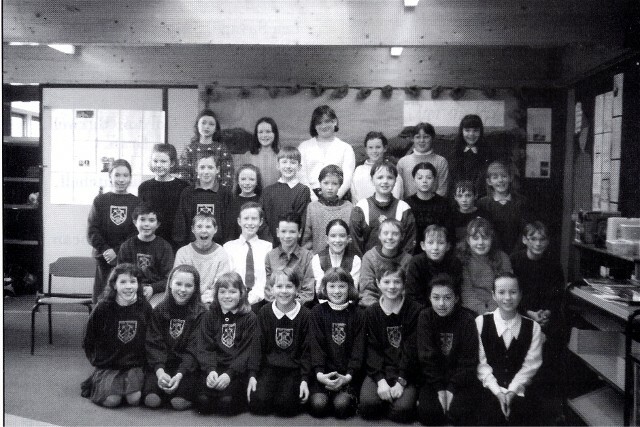 There's still a few of the faces here that stayed local in Invergordon or nearby. More than half I reckon. But everyone still looks the same! Just found this pic while browsing the web and it made me smile. Scary to think that we are going to be 25 this year!!!!! Hi, I wonder if anyone is still in contact with Adam Cran. My family name is Cran and it's quite unusual; wondered if he is related.